I would say it has something to do with the character encoding. Justin and I've discussed this earlier and I guess he hasn't actually implemented it yet. I think this is fixed now, isn't it? If so, thanks Justin! If not, well... I guess I need to buy new glasses! 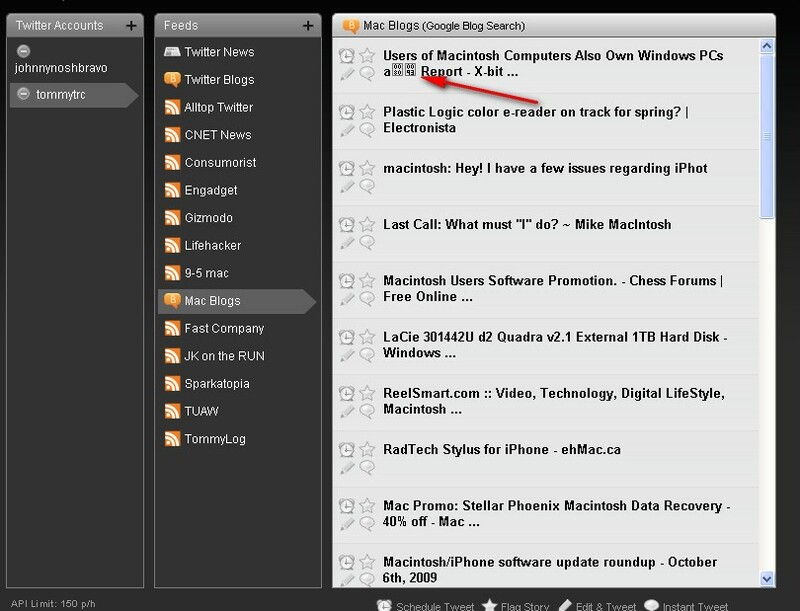 I'm also getting characters in my RSS Feed on the desktop version. Any fixes yet? Other than that, I like it. I'm still seeing this problem. The thing is that when you send this to the scheduled tweets or you actually tweet this item then it works fine with no corruption on the tweet side. This means that the RSS feed is using a character encoding that is incompatible with the overall website. Since the RSS feeds are from outside TweetMiner I'm not sure that there is anything Justin can really do to fix this. I'm still seeing this problem. The thing is that when you send this to the scheduled tweets or you actually tweet this item then it works fine with no corruption on the tweet side. This means that the RSS feed is using a character encoding that is incompatible with the overall website. Since the RSS feeds are from outside TweetMiner I'm not sure that there is anything Justin can really do to fix this.